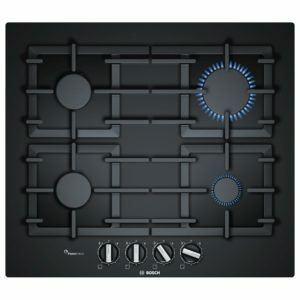 The Bosch PCP6A5B90 60cm gas hob is finished in brushed steel and includes 2 cast iron pan supports. 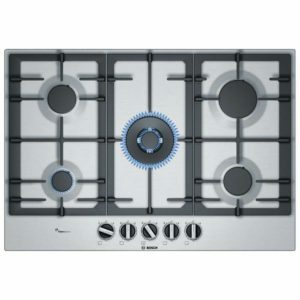 This simple and classically designed hob will be the backbone of any kitchen both in terms of design and features. With 4 burners, front-mounted controls and a flame failure safety device, it covers all bases in regards to both safety and functionality. Although the hob is preset for natural gas it also comes with LPG jets for conversion over to LPG. This handy 14cm warming drawer is perfect for popping in those plates before a meal. Not just for crockery, you can warm and defrost food. With four temperature levels and settings you can just select what you need for convenient warming. With handless push pull opening it looks sleek and stylish, perfect as part of a modern kitchen with other appliances across the range. 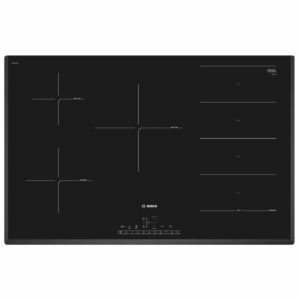 Sleek and easy to maintain, this frameless ceramic hob from Bosch keeps things simple. Finished in black glass, it has a timeless look that works well in any kitchen. 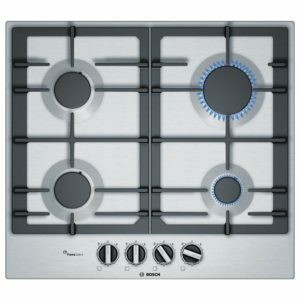 With four heat zones each featuring nine power levels, you have great control whether you want to boil, simmer or fry. 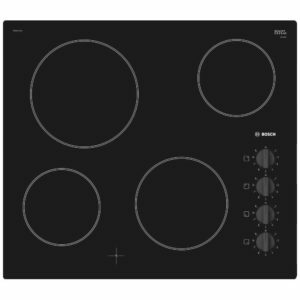 Being finished in versatile brushed steel, the Bosch PCQ7A5B90 75cm 5 burner gas hob will blend into any style or size of kitchen. Easy to use front-mounted controls and cast iron pan supports finish off the design perfectly. Although preset for natural gas, LPG jets are included for conversion to LPG gas. The flame failure safety device is activated if the burner is accidentally extinguished; the thermostat reacts and shuts off the gas supply to the burner. The style and design coordinate beautifully with Bosch ovens and compact appliances creating a streamlined look in your kitchen. 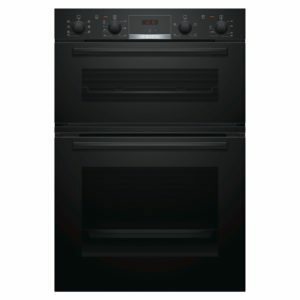 Finished in stunning black, this double oven offers brilliant cooking performance with great style and design. 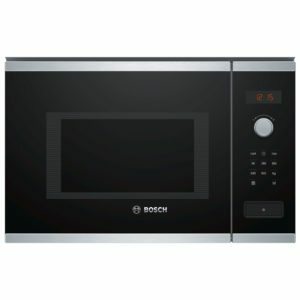 The MBS533BB0B from Bosch is designed to fit in a tall housing unit and will make an eye catching feature in a modern kitchen. Boasting two great capacity ovens, which have functions ranging from grill to conventional heat to gentle, you can always pick the best cooking option for every meal. Not to forget the 3D Hot Air option, which disperses heat evenly across three levels with no transfer of taste, so you can bring out your inner baker with ease! Being finished in versatile brushed steel, the Bosch PCS7A5B90 76cm 5 burner gas hob will blend into any style or size of kitchen. Easy to use front-mounted controls and cast iron pan supports finish off the design perfectly. Although preset for natural gas, LPG jets are included for conversion to LPG gas. The flame failure safety device is activated if the burner is accidentally extinguished; the thermostat reacts and shuts off the gas supply to the burner. The style and design coordinate beautifully with Bosch ovens and compact appliances creating a streamlined look in your kitchen. Look out for this outstanding Bosch BFL554MS0B microwave. Offering five power settings, a memory function and a 25 litre capacity there's great versatility, whatever you are cooking. Finished in stunning stainless steel and black glass, with a wide range of matching ovens, this microwave would be the perfect addition to any modern kitchen. 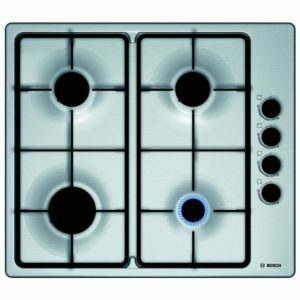 Based on a more traditional design the Bosch PBP6B5B60 60cm 4 burner gas hob is simple yet practical and offers Bosch build quality and value for money. Finished in brushed steel it is perfect for the more traditional kitchen. Cast iron pan supports are easily removable making it quick and simple to keep the base clean and hygienic. 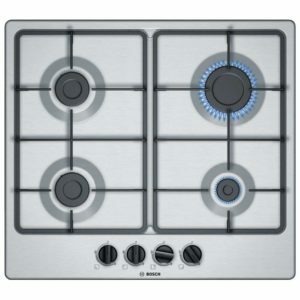 Although this hob is preset for natural gas, it is easily converted to LPG gas with the LPG jets included. The perfect addition to a modern kitchen, the fantastic BFL553MS0B from Bosch offers brilliant convenience in style. Whether you display the microwave alone or in co-ordination with other appliances across the range you are guaranteed great aesthetics. With a handy five power levels and retractable dials you will find this model easy to use, whatever you need to heat! 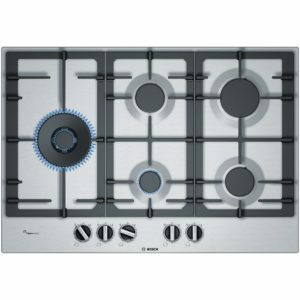 The Bosch PGP6B5B60 60cm gas hob is finished in stainless steel and includes cast iron pan supports. With 4 burners, front-mounted controls and a flame failure safety device, it covers all bases in regards to both safety and functionality. Although the hob is preset for natural gas it also comes with LPG jets for conversion over to LPG. Stylishly designed with black glass and high quality cast iron pan supports, this superb hob from Bosch can be surface mounted or flush fitted. Gas cooking is always popular due to its fine control of power, and the PPP6A6B90 offers even more control thanks to the ingenious Flame Select system that offers 9 precise power levels. Preset for natural gas, you can adapt it for LPG through the use of included jets.